Vera Pinho’s laugh precedes her. It’s loud and contagious and frequent, punctuating her sentences and disarming, instantly putting you at ease and cheering you up all in one audible second. There’s a joke here about having whatever she’s having, but it’s just her way, radiant and carefree with an undertone of wisdom that suggests she chooses happiness and it chooses her right back. This playful nature bubbles right into her latest craft of creating artisan soaps. Vera countered childhood boredom by drawing page after page with the same restless hands that she has now at 35, fidgeting, always searching for their next project, uncomfortable with prolonged idleness. She’s not too particular about how art seeps into her life—she just knows that it will, as it always has. She has no intimidating résumé speckled with gallery shows, no midtown studio with endless sales and too-high rent. Being an artist is simply who she is, and like her warm laugh, her way of seeing the world brightens everything she touches. When her five-year-old son, William, has a birthday, she can’t help but create a camera-ready cake with a thoughtful theme that makes him shriek with elation. When she worked a stint as a barista, she used the opportunity to perfect her latte art, causing customers to gasp and grin. And when she comes bearing gifts for her friends, as she often does, they’re handcrafted tokens that you know were made solely with you in mind. Vera is a maker, and for her, making is like breathing: half of the time, she doesn’t even know that she’s doing it. More than that, though, she’s a giver. Her art, no matter what form it takes, is pretty, yes, but that’s not the point. It exists to make people smile. Meeting her now, it’s difficult to imagine that she wasn’t always this bright spark that you can’t help but want to be near, hoping to catch a fallout ember of her creativity and passion for life. Following the birth of her son, she stopped seeing color. When she went to bed, the world was dark, confusing, meaningless. When she woke up, it was the same. She stopped making things. A blanket of dust shrouded the camera she once toted everywhere, untouched paint in tubes grew dry, the glitter in her eyes dimmed. It wasn’t her vision. It was postpartum depression that dragged on, unrecognized, for four years. Even though one in 7 women suffer from it, it goes widely undiagnosed and untreated. It swallowed her, and it took her a long time to realize what was happening and climb out of the belly of postpartum depression. One thing was certain: the more she meditated, the more the fog started to clear. “Postpartum depression is weird because you slowly have to become confident in and learn about who you are now, because, let me tell you, it’s not the same person you were before,” Vera says. Vera may not be the same person that she once was, but her creative spirit has amplified. As soon as she emerged on the other side of depression, she dove headfirst back into making. Her latest artistic adventure is something of a tribute to the healing powers of crystals. 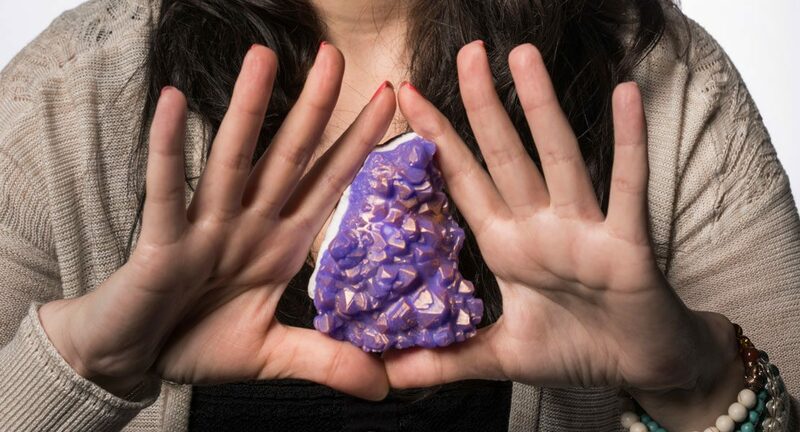 She started handcrafting stunning soaps in unique shapes of geodes. The irony of soap being one of the most primitive versions of self-care isn’t completely lost here. Whether you’re into meditation or not, ever since Vera started her self-care practice, she’s been tackling some of life’s most challenging obstacles with grace. Best of all, her laugh is back, and it’s louder than ever. To see more of Vera Pinho’s art or order her handmade soaps, visit etsy.com/shop/handmadebyveralucy and instagram.com/handmadebyveralucy.